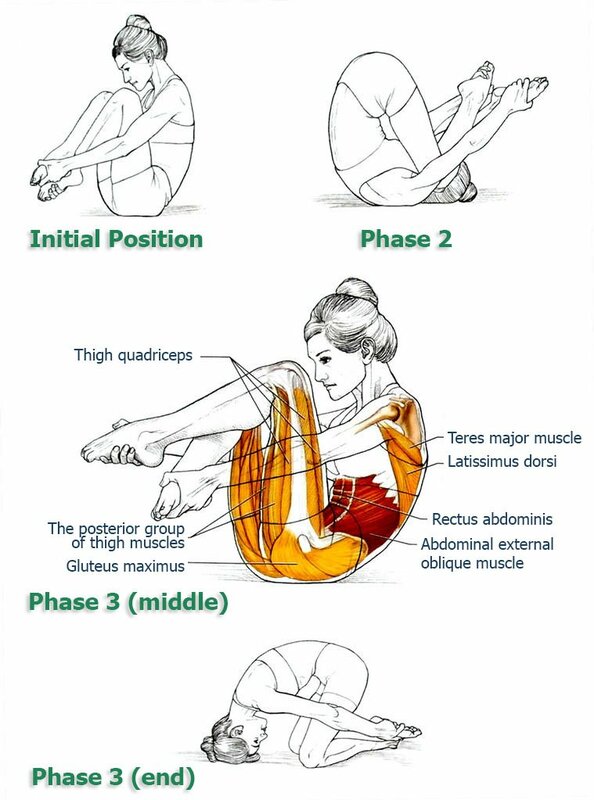 If you are just joining us, make sure to start at the beginning of this program of exercises to improve flexibility and movement of your spine. Today we’ll demonstrate a challenging, but unusually fun, exercise, the Crab. Breathing out, roll forward to the original position, and then even further to kneel down and rest against the forehead on the mat. Return to starting position and repeat the exercise 6 times. After the last repetition return to the starting position, staying balanced on the buttocks. The most difficult part of the exercise is the movement across the knees and the head touching the mat. Try to keep a mental image of your exercise partner pulling you over the waist to raise your pelvis. The same image can be maintained when returning to the starting position. This will help you perform the movement more easily and smoothly. Perhaps Crab got its name because of the specific positions of the limbs with the elbows and knees out to the sides. Anyhow, Crab is a complex exercise that should be performed only by those who have already gained experience and mastered the technique of both Rolling Over and Seal. It has much in common with these exercises. It is just as good at stretching the spine extensor muscles and developing coordination assistance of the abdominal muscles. It also refines the skills of using movement inertia and maintaining balance on a small support area. This is why it’s part of the exercises to improve flexibility and strengthen the muscles that support the spine. 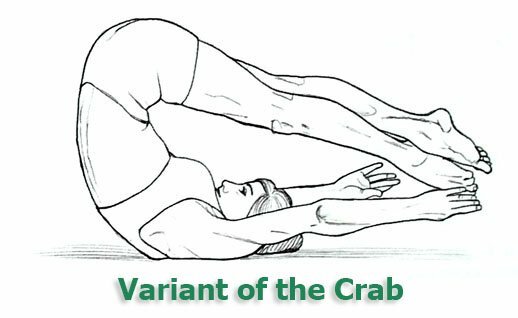 However, the Crab presents an additional complexity – continuing the forward movement, building on the knees, which are in a very vulnerable position since they are bent and held strongly to support the entire body weight. In addition, the knees are slightly separated to the sides, which further puts them at risk if the performing technique is compromised. The end position can create undue stress on the neck, if you are not in control of the movement. Therefore, this exercise is not recommended for those who have problems with their knees, or neck, or have other health issues which may increase the potential risk. When you perform the Crab, while on the back, you can release the legs and then cross them again. At the same time, they either remain bent at the knees, or they can be straightened, and then bend again (as shown on the image above). This option brings the exercise some variety. Quick change of the positions of the hands and feet requires coordination of many muscles, especially since we cannot disrupt the stability of the center and the smoothness of the overall movement. Since the introduction of new elements takes time, it is recommended to slightly change the breathing pattern. Exhale in the phase of rolling back, followed by taking a breath when changing the position of the legs. Exhale again during the return movement and breath-in once again when the head hits the mat and the mild stretching of the neck muscles. Once you’ve had your taste of the Crab, it’s time to move on to through our program of exercises to improve flexibility and movement of your spine.